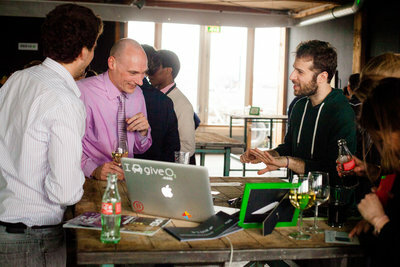 The first European Smart Energy accelerator concluded its program with Demo Day in Amsterdam yesterday. 9 smart energy and sustainability startups of Rockstart's Class of 2014 pitched to 250+ investors, industry executives, mentors and press. Keynote speaker was Simone Cicero the co-founder of the company behind the world’s first electric open-source vehicle. As of today, the Rockstart Spring Program begins and is focused on fundraising, gathering press and establishing partnerships. In mid-May startups will depart for an international roadshow to energy hubs which is tailored to help the startups build a solid international network. 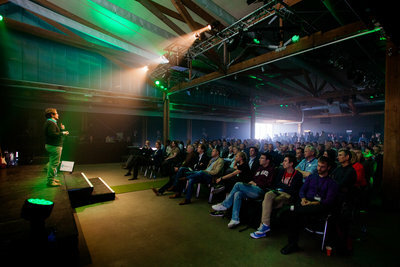 Applications for the next Rockstart Smart Energy accelerator open in fall 2014. 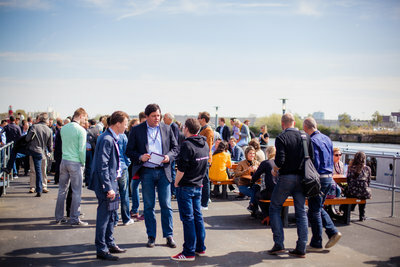 AMSTERDAM, APRIL 18 - The first European Smart Energy accelerator concluded its program with Rockstart Demo Day in Amsterdam yesterday. 9 smart energy and sustainability startups of the Class of 2014 pitched to 250+ investors, industry executives, mentors and press. 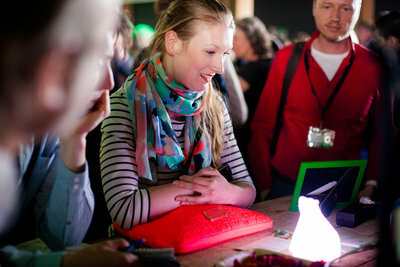 During Rockstart Demo Day startups announced several big European partnerships. Many of the teams got on the radar of interested investors and are already arranging their first meetings with them in the upcoming weeks. In the next three months the startups will follow the additional Rockstart Spring Program which is focused on raising investment, making partner deals and building their base. Crowdfunding platform for solar We Share Solar announced their big partnership with the Ajax stadium (Amsterdam Arena) that involves the installation of 561 solar panels on the stadium’s roof. Individuals will have the opportunity to invest in the project through WeShareSolar’s platform. This is the second big solar project completed through this smart energy startup. In their the first successful project with another big football stadium in the Netherlands (Groningen FC) the crowd invested over 300k euros on 531 solar panels placed on the top of the stadium. The details of the latest partnership will be announced the coming weeks. Another exciting news came from the Greek startup TheCityGame - an app, which empowers users to perform good actions for the environment and society. The team announced that they have closed a deal with the biggest recycling company in the Balkans, ANAMET, that will use their app to encourage and enhance recycling behavior. Rockstart’s Smart Energy accelerator aims to be a driver of innovation and help disrupt the energy sector by supporting and inspiring entrepreneurs. 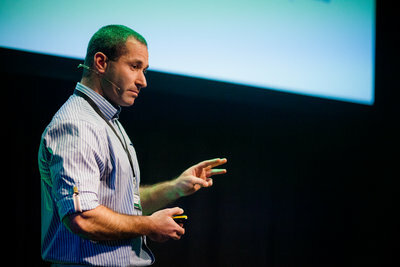 In this context Rockstart invited Simone Cicero to kickstart Demo Day and present OSVehicle, the company behind the world’s first electric open-source vehicle. The company just released their first car, Tabby, which can be assembled from 3D printed customizable parts in 47 minutes. “We are moving from ownership towards access”, said Cicero highlighting the importance of open sourcing, collaboration and open access to the environment, society and economy. We Share Solar aims to give anyone access to solar power. Through their crowdfunding platform, WeShareSolar connects consumers who cannot have solar panels installed on their rooftops, to big property owners (like schools, hospitals, stadiums) who can. Property owners can save money on their energy bills, crowdfunders (consumers) can make money by investing in green energy. Dreamups (Netherlands) aims is to organize and make accessible all world’s open technologies.They are introducing a powerful collaboration, version management and analytics platform for engineers and product designers. It’s an easy and fast way for them to move from ideas to ready-to-manufacture products: be it 3D printing, alternative energy, robotics or space engineering. The City Game (Greece) is an app, which empowers users to perform good actions for the environment and society using gamification mechanics. TheCityGame has already raised 40k and is planning its first launch in Athens the upcoming months. Power-Tags (Israel) are implementing location tracking solutions in wearable devices. Their location-tracking bracelets can be used to automatically monitor elderly people’s daily activity in their own homes. This is especially useful for people suffering from diseases such as Alzheimer’s, dementia and osteoporosis. The solution allows their relatives to keep track of the their physical activity over time and notifies them in case of an emergency, such as a fall. Bundles (Netherlands) make quality appliances accessible to everyone. Bundles offer a pay-per-use solution that allows people to lease high quality household appliances at near-retail costs. Bundles comes with an app that allows households to use their appliances in a cheaper and more sustainable way by saving energy, water and detergent. Bundles have established partnership with Miele, Onzo and UppEnergy and have already paying customers. Qwiksense (Netherlands) enables organisations to create healthy, productive and energy efficient work environments by generating actionable sensor data and analytics. With Qwiksense companies measure the quality of work environments using sensors and devices that track CO2 levels, temperature, dust, humidity and other relevant factors. Based on that data, relevant suggestions can be done to improve the environment, and save energy in the process. MiniPower (Netherlands) makes wind energy truly sustainable by giving a second life to wind turbines. MiniPower facilitates the re-use of wind turbines removed from the wind parks in the Netherlands and Germany and installs them in small size wind farms in countries such as Greece, Turkey and Croatia. The first project (wind park) is planned to be launched in Greece. GiveO2 (Chile) helps track and measure physical activity and encourages employees to move more. The US employee wellness market is 6 billion dollars while the engagement rate is extremely low (5-10%). GiveO2 provides an effective alternative to these programs increasing significantly the engagement rate up to 50%. The app is already available on App Store and Google Play. CareToSave (Ukraine, Norway) introduces a product system for families (Bobo Universe) focused on teaching kids how to save energy at home. The main product is a physical polar bear, which changes color depending on the amount of energy that’s being used at home. 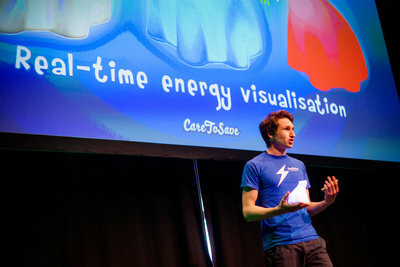 It is connected to a gamified app (web and mobile) that makes energy consumption patterns and statistics visible in real-time. The app is based on the storybook series it comes with, named “Bobo’s Journey”. The whole package (Bobo, book and app) can be now pre-ordered. The startup is planning to launch the product through a crowdfunding campaign in fall. The first batch is aimed to be delivered right before Christmas 2014. The spring program begins today and has the objective to coach the teams on fundraising and closing the right deals - a rather sensitive and complex business in the energy industry. In mid-May and June the startups will follow a roadshow to international energy hubs and participate in big energy and sustainability events. This international trip is tailor-made to facilitate connections to interesting organizations, investors, partners, customers and related startups to broaden the startups’ international network. Rockstart’s Smart Energy startups will participate in international industry events such as the Smart City event in Amsterdam, CleanTech Forum in Stockholm, Eco Summit in Berlin, and Energy & Environment Expo and cleanweb in London. 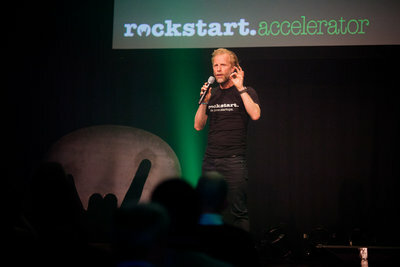 Rockstart Smart Energy accelerator launched in January 15, 2014. The 2014 Class included startups innovating in the areas of renewables, energy savings, energy awareness, smart buildings & homes, recycling, cleantech hardware, and carbon emissions. The startups were selected out of 130 applications from 39 different countries. “It’s been 100 hectic, super intense days. We’ve been meeting a lot of great people, changing, pivoting and hustling like crazy. But every time growing, getting something newer and better. The network we built and the advice we got is something we’re going to take and carry with us with all that’s coming up in the future”, says Cristian Schalper, co-founder of GiveO2. A Rockstart Accelerator is an intensive startup program that helps entrepreneurs take their companies from early traction to the global market in 6 months. It provides investment, office space, highly specialized knowledge, and access to a broad network of international mentors, partners and investors. The first Rockstart Accelerator launched in 2012 and has accelerated 40 startups in four programs in the Web/Mobile and the Smart Energy space. The earlier two Web/Mobile Accelerators have shown good results: 70% of the two batches of startups have been funded by investors like Greylock Partners, Balderton Capital, Noro Capital, Vitulum Ventures and other renowned European and American angels. The third Web/Mobile accelerator is now in progress. Applications for the next Rockstart Smart Energy accelerator open in fall 2014.